Goofy hosts a breakfast and dinner buffet at the Disneyland® Hotel along with his pals. California farm-to-table cuisine at Disney's Grand Californian Hotel®. 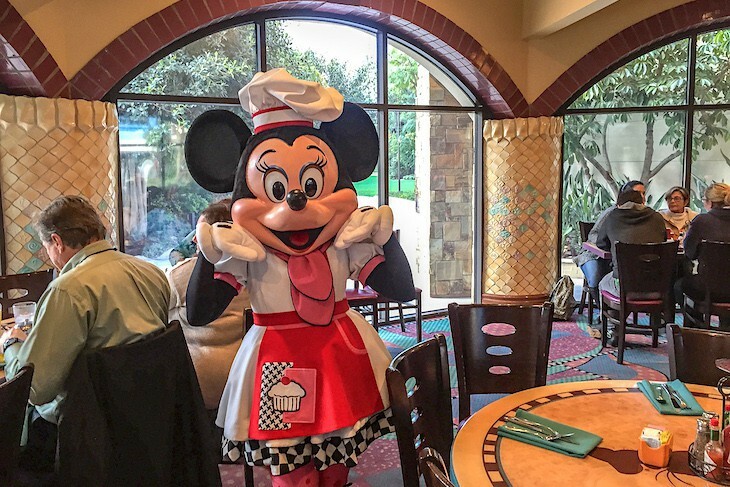 Breakfast with Disney princesses and a la carte dinner-no characters. 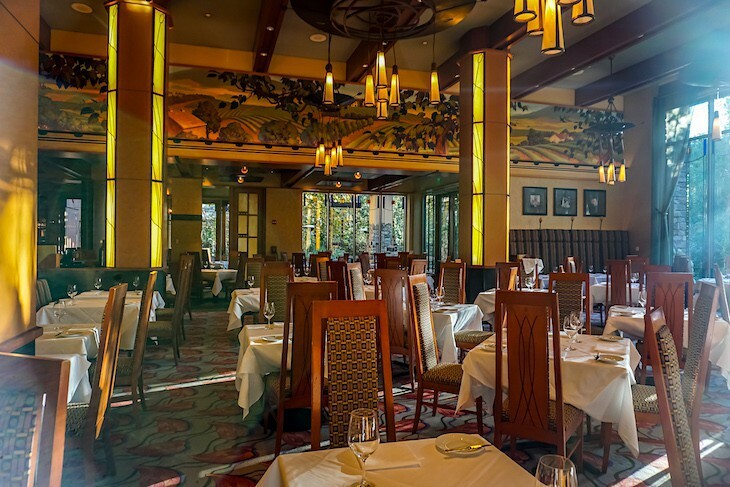 For more than a decade Disney's Grand Californian Hotel has been known for innovative cuisine at the exceptional Napa Rose. 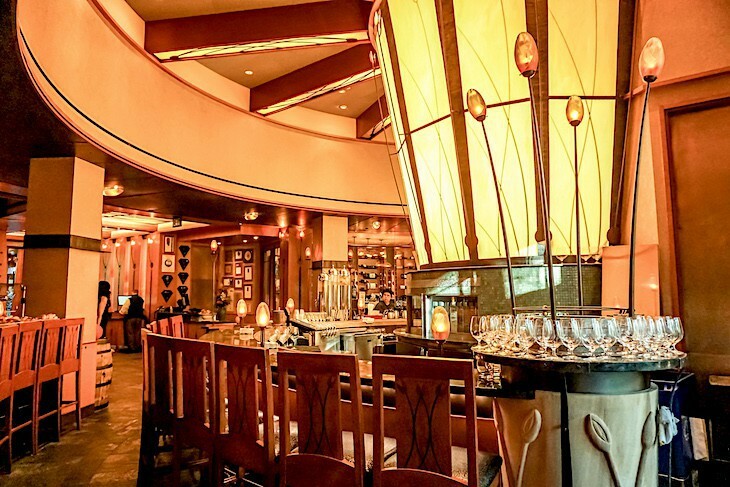 Chef Andrew Sutton’s contemporary cuisine is its claim to fame making it a must-do on your Disneyland® Resort list. Focusing only on what is fresh and seasonal, guests dine in a lovely Arts and Crafts-style room with murals of the California wine country, an exciting exhibition kitchen, and massive windows overlooking the California Adventure park. Begin by ordering the ridiculously delicious Smiling Tiger Salad composed of greens tossed with baby radishes, spicy dried filet mignon (almost like a jerky), and a rich coconut milk vinaigrette spiked with pesto and Sriracha topped with savory lobster tempura—definitely lives up to the hype. And even if pizza isn’t your idea of California cuisine, Napa Rose’s luscious signature version with smoked prosciutto, red grapes, caramelized onions, and oh-so-creamy Cambozola cheese hits the mark. However, on a subsequent visit the seasonal lamb and cherries pizza’s center was undercooked and the cheese not bubbly and brown enough for my taste. Salmon served three ways: roasted with Meyer lemon, escabeche-style (like a ceviche), and tangerine cured sashimi with dill (much like gravlax) was a big hit as was the sublime seared diver scallop appetizer bathed in a bed of lemon sauce with diced tomatoes, just a hint of vanilla, and accompanied by chive potatoes speckled with lobster. Or choose the portobello mushroom bisque "cappuccino", so rich it’s served in an espresso cup, then topped with brandied thyme “froth”. A seared halibut was nice and light sitting on a brothy mixture of cannellini beans spiked with chopped carrots and celery and dabbed with pesto, the bonus being a succulent stone crab claw topping. While not particularly bad, it just wasn’t exciting. Rather go for the always great Colorado rack of lamb, rubbed with salty Provencal herbs then roasted sided with luscious Cabernet jus and buttery Red Nantes carrot puree spooned over artichoke bottoms and poached radishes. Delicious essentials: wild striped bass arriving crispy-skinned, bathed in flavorful tomato broth, surrounded by Manila clams and tender haricot verts; or a perfectly pink duck breast with a rhubarb orange marmalade, thankfully lacking in what could have been cloying sweetness, served in a simple au jus with nice spring onions and kale. You could also go with the tender filet mignon, its preparation changing with the seasons; ours was served with a highly flavored braised oxtail ragù in a vibrant Cabernet jus with precious baby corn fritters. And speaking of another must, it’s the truffled mac and cheese served piping hot in a miniature copper pot! If you love to watch the action in the kitchen, consider the restaurant’s Chef’s Counter accommodating up to eight people with two seatings per evening. At the counter are three menu options: the regular dining room menu, a four-course Vintner’s Table pre-fixe menu that changes weekly . . . or simply have Chef prepare a multi-course meal according to his whim and your taste. Feel free to chat up the kitchen staff, asking any questions that might come to mind. 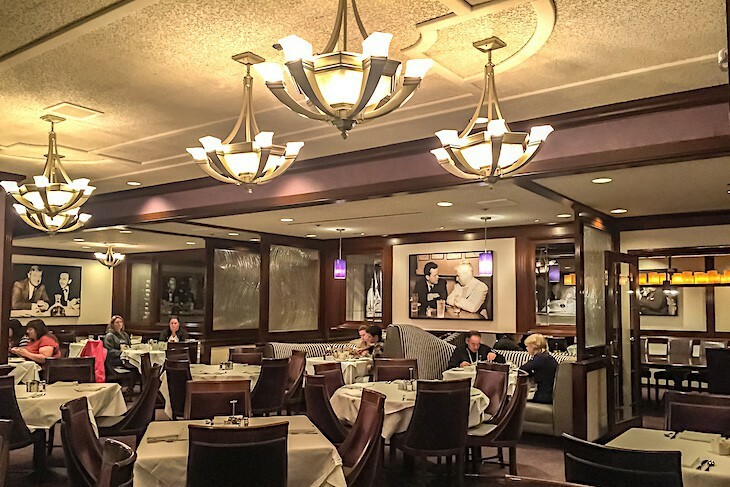 If you arrive without a reservation it’s possible to dine in the restaurant’s spacious lounge where a full menu is served along with cocktails and the award-winning California wine list. And don’t hesitate to heed your server’s wine suggestion since, believe it or not, every server in the restaurant is also a sommelier. 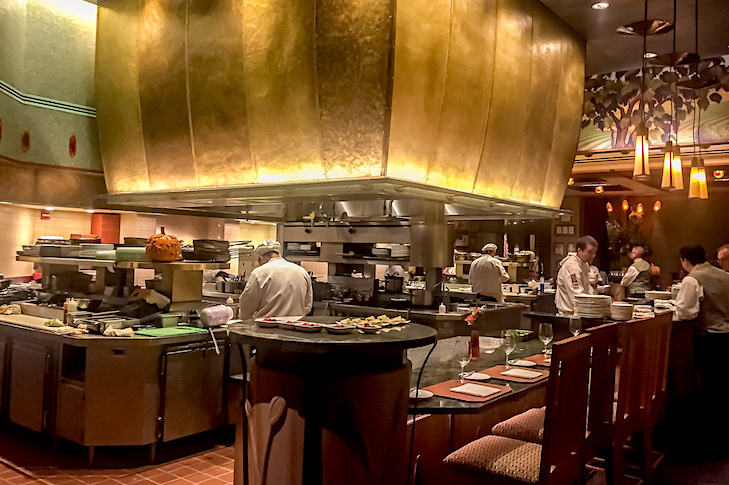 Steakhouse at the Disneyland® Hotel. Breakfast and dinner. Ditch your park clothes and take a step back to the glamour of classic Hollywood at this clubby spot. 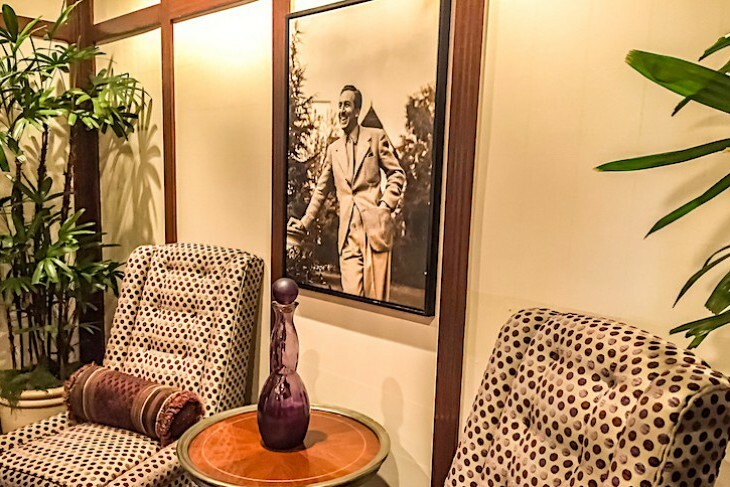 The décor is art deco with the addition of framed vintage photos of Walt Disney and the heyday of Disney Studios. Begin with a super-sized loaf of hot, chewy sourdough with plenty of creamy butter. As for starters, the 55 Salad changes seasonally with the spring choice being mixed greens with ruby beets, feta cheese, an interesting apricot granola mixture, and citrus vinaigrette. I wouldn’t be tempted by the Caesar salad whose flavorless dressing is made somewhat more interesting with toppings of lardons, sourdough croutons, Castelvetrano olives, and shaved Parmesan. I’m a filet kind of gal, and it did not disappoint, amazingly tender and served with a marrow fork to scoop out all the goodness of the surprise marrowbone accompaniment. Sauces, if ordered, arrive on the side with the garlicky SH55 butter (skip the disappointing peppercorn sauce) the best. The New York strip seems to be what most of the waiters recommend, but it tends to be too chewy for my tastes but with a superb flavor—here the “Oscar” style topping of crab cake and béarnaise sauce is a great choice. Super sides include a scrumptious Delmonico casserole, creamy with gruyère and spiked with meaty bacon. Or you can’t go wrong with the sautéed French green beans sprinkled with crispy, thin-sliced onion rings, mushrooms, and plenty of melted butter. Of course, it’s a steakhouse, and the dessert choice pretty much rests with a vanilaa crème brûlée, a traditional yet delicious option. One of Disneyland Resort’s best-kept secrets is the 55’s breakfast. No one seems to know about it, but it’s the perfect place for a bit of serenity in the morning hours before heading out for the parks. Lovely eggs benedict or, my favorite, the fluffy omelet with your choice of filling—go for the ham, cheese, avocado option. And mustn’t forget the classic afternoon tea served her from 12 p.m. to 3 p.m with sparkling wine, teas and herbal infusions, scones, tea sandwiches, and desserts the menu. Bring along the kiddies for their own special tea choices. Mickey Mouse hosts a popular breakfast at Disney's Grand Californian Hotel® along with his friends for breakfast and brunch. Dinner buffet without characters.